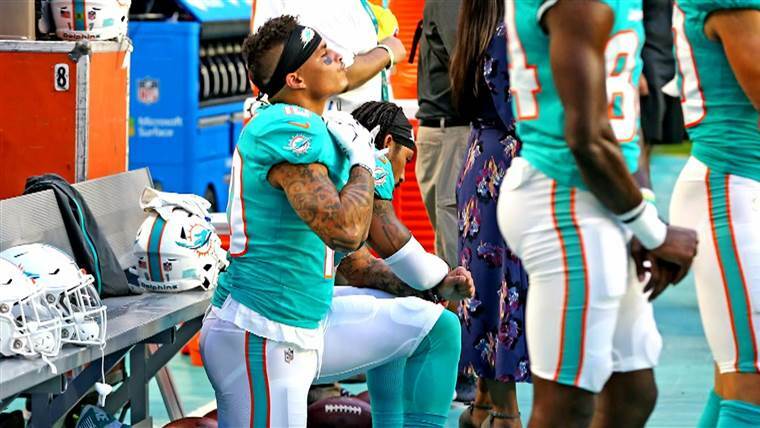 The NFL preseason has hardly begun, and already several players from the Miami Dolphins and the Philadelphia Eagles have protested during the national anthem, proving that this controversy is not about to go away. President Donald Trump pounced on the issue once again on Friday, blasting the protesters and calling for the league to take decisive action against those who would disrespect the flag. The protesting NFL players are now kneeling as much in defiance of Trump as they are in recognition of police brutality or solidarity with Colin Kaepernick or whatever foolish reason they were originally performing this pantomime. Many of them now see this us “them vs. Trump,” which is a bad reason to tank the entire industry. In continuing to kneel and raise fists and find other ways to disrespect the anthem and the flag, they are accomplishing the exact opposite of their stated intentions. Instead of drawing attention to the source of their protests, they are merely turning fans, patriots, vets, white Americans, and much of the country against them. They are closing minds and shutting down avenues of debate. Whatever legitimate grievances they might have, they are ensuring that they will never be heard by anyone other than the already-converted. There was an old Beatles line: “But if you go carrying pictures of Chairman Mao, you’re never gonna make it with anyone, anyhow.” Much the same could be said of these protests. There are millions of Americans willing to listen to concerns about police brutality, criminal justice system unfairness, and the rest of it. But when you try to start that conversation with anti-police, anti-military, anti-American gestures and rhetoric, you’ve lost before you’ve ever begun. To have real, honest conversations about these problems, we have to find common ground. And if the ground you’re standing on (or kneeling on, as the case may be) is one that considers America an evil, racist nation…well, all we can say is good luck with that.